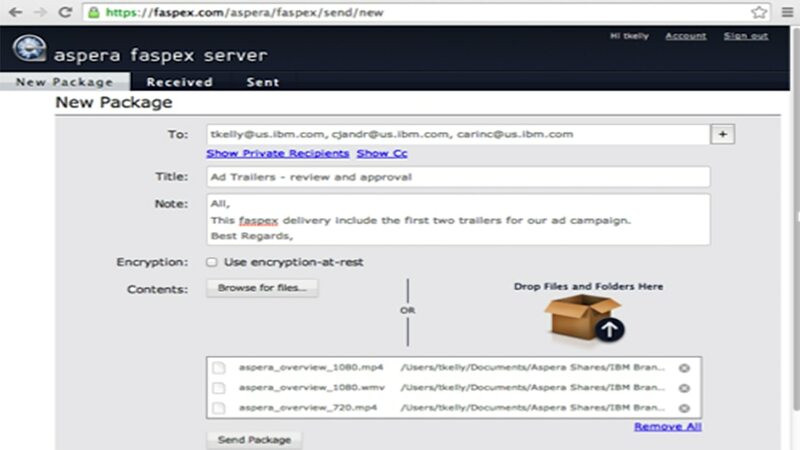 IBM® Aspera® faspex™ enables high-speed transfer of files and directories, regardless of file size, transfer distance or network conditions using the patented Fast, Adaptive, Secure Protocol (FASP) transport technology. It delivers data reliably with automatic resumes of partial transfers and retries for interrupted transfers. This software uses a familiar email-style workflow that allows anyone with a valid email address to send digital packages. It offers a variety of interfaces including a web browser plug-in, a desktop application, a Microsoft Outlook add-in and the IBM Aspera faspex Mobile app. It supports WiFi, 3G and 4G networks and provides remote source publishing (enterprise and cloud) that allows users to browse any remote storage location and attach files or directories to a faspex package. IBM Aspera faspex provides configurable security options including session timeout, concurrent login prevention and comprehensive package access and expiration policies. Supports comprehensive administration, user management & access control with secure authentication. It provides easy setup and management of workgroups with useful features and controls and enables a single point of management for large, distributed environments. IBM Aspera faspex uses a highly concurrent user connection architecture and enables unlimited scale-out of transfer performance and network capacity by deploying multiple transfer servers in a cluster, separate from the faspex web application. It uses IBM Aspera FASP Proxy within restrictive networks with the option of HTTP fallback. It supports deployments on cloud platforms with fast direct-to-cloud transfers of large files and directories to object storage. This software safeguards your digital assets with multiple layers of security. It integrates with LDAP directory services for import, synchronization, direct authentication and secure authentication, scalable to thousands of users. It enables package decryption when downloaded by the recipient and uses configurable AES-128 data encryption available both over the wire and at rest.